As you well know, we LOVE Nutella at Paging Fun Mums…you’d be crazy not too right? You can check out all of our other delish Nutella recipes to date here! 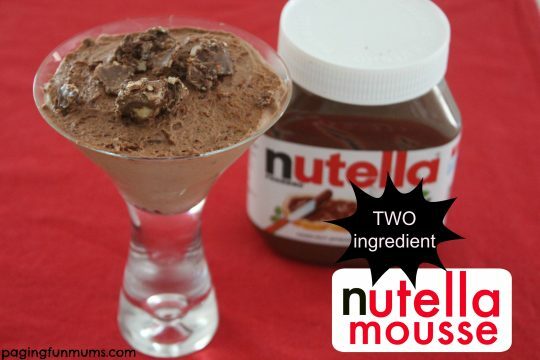 We have stumbled across yet another AH-MAZING Nutella recipe that will please any taste bud…which only requires TWO ingredients! Place the Nutella in a large bowl. In a separate bowl, whisk the double cream until soft peaks form. Add 3 tablespoons of the whipped cream to the Nutella bowl and whisk by hand until smooth. Place your mousse in the fridge to to set for at least 2 hours. 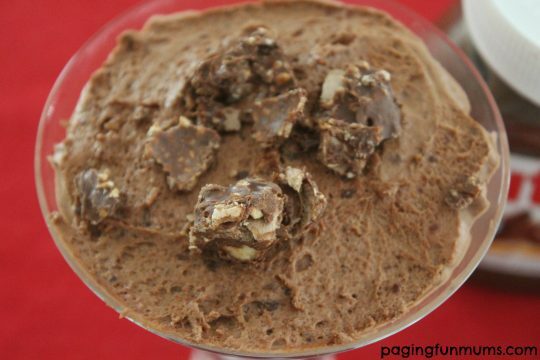 Break up a few Ferrero Rocher chocolates to add to the top! Enjoy your new found favourite dessert! I can’t explain how GOOD this is! It takes 5 minutes to make & the fridge does all the work! Head to our ‘Cooking with Kids’ section to find some other fun recipes! Or head to our YouTube channel here for some fun video craft tutorials! Is double cream different than whipping cream?